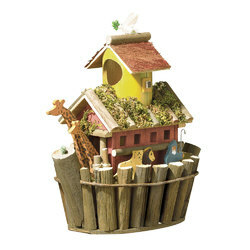 Noah's Ark wood bird house. Two by two the animals go, in this unique birdhouse overflowing with fanciful fun! 12 1/2" x 6 1/2" x 12 1/2" high. UPC: 849179014636.